This recipe is highly versatile, both in how you make it and how you use it. If you can't find labneh, substitute plain Greek yogurt. Feel free to add more or less of any ingredient, based on what you have or like. 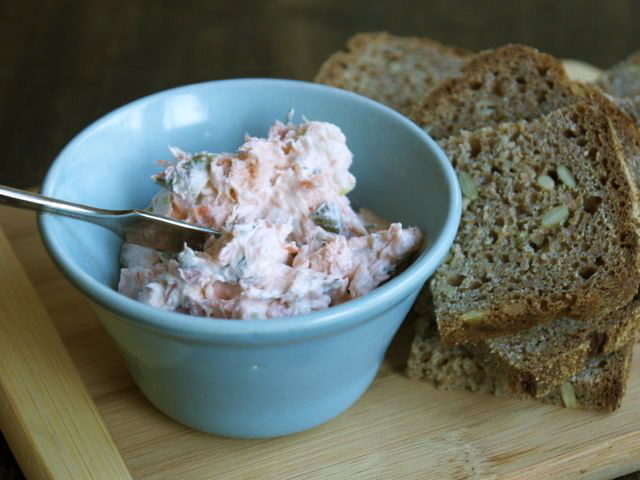 Spread the schmear on bagels, bread, little toasts, or crackers. If you're entertaining gluten-free friends, serve it with cucumber slices and celery sticks. For a tasty sandwich, spread the schmear on slices of dense rye or whole-grain bread, then layer with thinly sliced cucumbers and peppery salad greens (such as watercress or arugula). And for a dip, thin the schmear — either by using less cream cheese and more yogurt, or by adding a bit of milk — to make it more dunkable. In a medium bowl, place the labneh, cream cheese, green onions, dill, and lemon juice. Stir with a large fork until smooth. Add the smoked salmon, capers, and salt and pepper, and stir until incorporated. Taste and, if you like, adjust the seasoning with more salt, pepper, and/or lemon juice. Store in a glass container with a lid (I like to use a repurposed jam or pickle jar) in the refrigerator until ready to use.